Defense Secretary James Mattis is warning China there will be consequences if it continues its military buildup in the South China Sea. 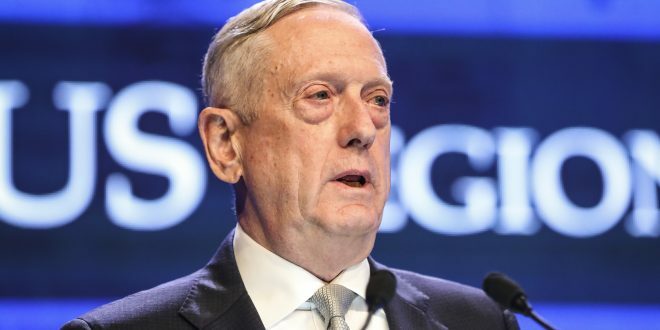 In comments at the Shangri-La Dialogue, an international security forum in Singapore over the weekend, Mattis said Beijing’s moves were designed to intimidate other countries in the region. “China’s policy in the South China Sea stands in stark contrast to the openness that our strategy promotes, it calls into question China’s broader goals,” Mattis said. China has built artificial islands in the disputed South China Sea, and the U.S. military says there is a high possibility that China has installed anti-ship and anti-aircraft missiles, as part of military exercises. Airstrips have already been constructed, and in May, China landed nuclear capable bombers on contested islands in the area. The South China Sea is one of the busiest shipping lanes in the world, and rich in fish and potential oil and gas reserves. Parts of the sea are claimed by several nations in Asia; China says it has territorial sovereignty over nearly the entire waterway. He Lei, a deputy president of the Academy of Military Sciences at the People’s Liberation Army, headed the Chinese delegation to the Shangri-La Dialogue, and said the disputed islands in the South China Sea are Chinese territory. Earlier in the week, Mattis warned the United States will continue “a steady drumbeat” of naval exercises to challenge China’s territorial claims in the waterway, and this weekend said, “there are consequences that will continue to come home to roost” if China does not act more transparently and cooperatively in the region. Last week, the U.S. withdrew an invitation for Beijing’s participation in naval exercises known as the Rim of the Pacific. China had participated in these exercises in 2014 and 2016. On Sunday, two U.S. warships sailed within 12 nautical miles of the disputed Paracel Islands in the South China Sea, drawing a sharp rebuke from China. China’s Defense Ministry spokesman, Wu Qian, called the US warships a “provocation” which violated international laws, and blamed the United States for growing militarization of the region. In Singapore, Mattis vowed to support U.S. allies in Asia, “No one nation can and should dominate the Indo-Pacific. Our Indo-Pacific strategy informs our relationship with China.” Mattis emphasized that the U.S. military wants more transparency from China. “So, when [Beijing] do (sic) things that are opaque to the rest of us, then we cannot cooperate in areas that we would otherwise cooperate in,” he said. CNBC reports his comment could refer to China’s One Belt One Road policy, which calls for $1 trillion of investment in infrastructure and other projects along trade routes linking China to Europe, Russia, Central and Southeast Asia, and Africa. Mattis said he plans to travel to Beijing later this month. His comments come ahead of a planned June 12 summit between President Trump and North Korean leader Kim Jong Un.